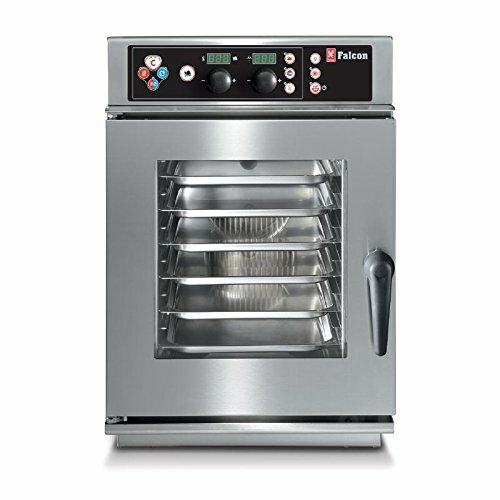 The FAST DRY system ensures fried, au gratin and grilled food has that perfect crunch Low temperature night cooking function enables the conservation of energy and minimisation of weight loss Fast defrosting function significantly reduces waiting time for frozen food to thaw Water Inlet Connection: Ø 3/4"
The Falcon 6 Grid Compact Combination Oven Manual 3 Phase Electric 625mm offers a range of features that makes producing consistently great food effortless. Some of these exceptional features include a hand shower, a fast defrosting function, and a 99 programme storage capacity with up to 4 individual steps in each, guaranteeing that food quality and consistency is maintained, regardless of the operator. This makes these combi ovens ideal for establishments who cater on a large scale but with limited space, such as hotels, schools and large chain restaurants. This, along with the CALOUT boiler limescale prevention system keeping your oven in perfect condition, there has clearly never been a better time to purchase a Falcon Combination Oven. Requires both hardwiring and a water treatment system (AE393 Aquaquell Purity 600) sold separately.